Otitis externa – infection/inflammation of the outer ear canal, i.e. outside the ear drum. Infestation – the term used when a parasite is living on a host and this includes the skin and ear canals. Otoscope – an instrument that uses light and magnification to examine the ear canal. Otitis externa is the most common form of ear disease. 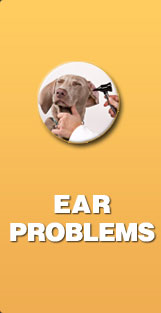 If you’ve ever had a pet with an “ear infection” it most likely was otitis externa. Otitis externa is easier to diagnose than otitis media because the external ear canal is much easier to examine than the middle ear. Otitis externa causes symptoms of discomfort. Discomfort of the ears is usually manifested by any or all of the following signs: persistent shaking of the head, scratching at the ears and/or the side of the head, redness of the opening of the ear canal, discomfort when the ear is touched, presence of pus, presence of a dark material (“dirty” appearance), and odor. If your pet has any of these signs, ask to have your pet’s ears examined with an otoscope. Otitis externa needs to be treated and eliminated before it damages the ear. Otitis externa that is not adequately controlled can lead to severe constant ear pain as well as permanent narrowing of ear canal that requires extensive surgery to correct. Most ear infections are secondary infections. When ear infections do not resolve with therapy or keep returning soon after therapy is discontinued, further steps need to be taken to determine the underlying problem that is making the ear susceptible to infection. Ear mites are more common in young pets, e.g. puppies or kittens, and usually can be eradicated when treated properly and if all pets that live in the same household are treated at the same time. Ear mites are an uncommon cause of otitis externa in adult dogs and cats unless there is exposure to a puppy or kitten infested with ear mites. Otitis externa is an inflammation of the outer ear and ear canal. 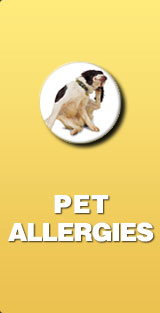 Animals are commonly prone to ear infection, and this is one of the most common manifestations of allergy in dogs. In dogs, those breeds with floppy ears are more prone, since air flow is limited and a warm, moist environment built up, which is conducive to infection. The external ear in animals is longer and deeper than in humans, which makes it easier for infection or wax to build up or be hard to remove. Complete ear canal inspection requires the use of an otoscope by a veterinarian. 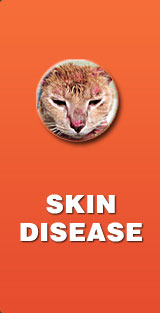 Infections are usually secondary to inflammation or to improper grooming techniques. 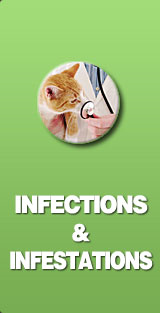 Infections can be caused by both bacterial and fungal origin, as well as small organisms such as ear mites. Malassezia pachydermatis is a common fungal agent for ear infections in dogs. Staphylococcus intermedius is the most common bacterial infection. A more serious ear infection, with pus in the ear, may be caused by Pseudomonas aeruginosa. Signs of ear infection include shaking of the head, and scratching at or under the ear. Some animals may also paw the ear or try to rub it on other objects to relieve pain and discomfort. Ear infections often result in a darker red ear, dirt in the ear, or a general inflamed appearance. 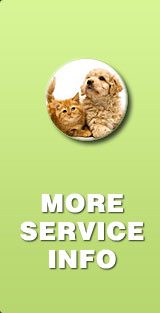 Treatment is usually by a dual regimen of ear cleaning and ear medication. Ear cleaning should be demonstrated by a veterinarian, due to the risk of pushing infected material deeper into the ear. The aim of cleaning is to remove any by-products of the infection which lead to further irritation and discomfort, and may be in turn, causes of further infection. Good care often involves cleaning the ear daily, to prevent build-up and bring the infection under control. Ear medications are applied after cleaning and drying, and is usually in the form of ear drops or ointment applied daily or twice daily for one or two weeks. The type of infection must be identified by the veterinarian by examining a sample of ear exudate under a microscope, since bacterial infection will only respond to antibiotics, fungal infection to a fungicide, and ear mites to an insecticide. In mild cases, a product with anti-inflammatory, anti-fungal and anti-bacterial ingredients are often employed. In more severe cases, ear cleaning under sedation or anesthesia may be required and evaluation for otitis media may be indicated. Treatment for ear mites include ear drops that contain pyrethrins or an avermectin such as ivermectin or selamectin. Cleaning of the ears is very important for treatment of ear infections. Cleansing and antiseptic mixtures are made from isopropyl (rubbing) alcohol, boric acid and acetic acid (vinegar) in various proportions. In some recipes, povidone-iodine (betadine) is added as well.